AFE Compressed Air Filters protect your equipment and instruments from the dirt, water, and oil usually found in compressed air. Airfilter Engineering (AFE) has developed a comprehensive range of filter grades to cater to the requirements of different applications. All our filter media are of pleated design to ensure higher filtration area. Here at AFE, filters and elements can also be custom-made to suit your needs. Our engineers in the research and development department ensure that we continuously satisfy the increasing demands of today’s sophisticated market with high quality filtration products to ensure clean compressed air is readily available. Airfilter Engineering guarantees you quality, reliability and efficiency in all our products which have been specifically designed to offer you the best solution for your compressed air filtration needs. Our filters are manufactured with either die-cast aluminium or carbon steel housings for a wide range of operating pressures, temperatures and capacities. These filters were designed in accordance with international standards and carry the CE mark, complying with the European Pressure Equipment Directive PED 97/23/EC. With over 10 years of experience, Airfilter Engineering offers a comprehensive range of filters and elements with different filtration grades to meet the recommendation of the ISO8573 for different types of users. AFE’s filters and elements have been engineered for low pressure drop, which gives the benefit of minimum energy and maintenance cost. Airfilter Engineering’s products are highly effective yet economical to your total business investment. The filters are fully tested for performance, safety and leakage, and treated to prevent surface oxidation. As we know air produced by your compressor contains water and other impurities. AFE’s filter is designed to remove these pollutants: the P grade high efficiency pre-filter/ particulate filter, which removes particles down to 3 micron. The particulate filter protects piping and pneumatic equipment from particulate damage by removing rust, pipe scale, metal oxides, and desiccant particles. The U, H & S grades are high efficiency coalescing filter. The high efficiency coalescing filter removes water aerosols, oil aerosols and solid particles to a specified level which gets rid of particles and oil aerosols down to 0.01 micron and 0.001 mg/m3 respectively. It is important to realize that a coalescer is excellent at removing aerosols and liquids but not vapours like hydrocarbons and odors. A vapour filter removes vapours with an adsorbent. The C grade, an activated carbon filter, is a vapour filter which removes oil vapor and hydrocarbon odors. Depending on the air flow and oil content in the compressed air, vapour filter elements need to be replaced every few months because the effectiveness of the activated carbon degrades as it adsorbs the oil. Compressed air filters should be installed in a level pipeline, mounted vertically, the bowl downward with one element length clearance for element removal. The filter should be installed at the highest pressure point available, and as close to the equipment being protected as possible and have a drip leg immediately upstream. Pressure drop is used to determine when to change a filter. Contaminants, pressure, temperature and other variables affect the service-life of a filter. 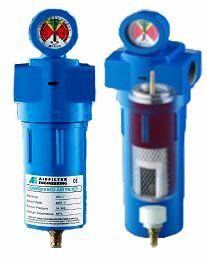 Generally in a compressed air system, when the pressure drop across the filter reaches 0.4 – 0.6 bar (8 to 10 psi), the element should be changed. 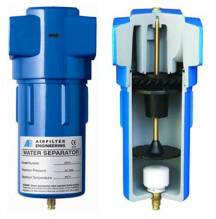 It is critical to drain the filter housing daily to release condensate that gathers in the bottom of the filter bowl. Automatic drain valves simplify this process and protect your system from water flooding. AFE’s filters provide air quality to the ISO 8573 standard—but it’s important to remember that the effectiveness of any filter is directly related to the performance of the filter element at minimal pressure differential. So check your AFE filter elements often and reorder when necessary to assure a steady stream of contaminant-free compressed air in your system!